All-inclusive starting price for a base model 2019 MINI Cooper 5 door is $27,380.00, which includes MSRP ($24,390.00), Freight/PDI ($2,475.00), retailer administration fee (up to $395.00), tire stewardship fee ($20.00), and A/C levy ($100.00). **Lease example: Selling price of a 2019 MINI Cooper 5 door is $26,465.00, which includes MSRP ($24,390.00) and Freight/PDI ($2,475.00), less credit ($400.00), at 1.99 % APR for 48 months. Monthly lease payment is $343.84 with $0.00 down payment. First month’s lease payment, security deposit of approximately one month’s payment, retailer administration fee (up to $395.00), A/C levy ($100.00), tire stewardship fee ($20.00), fees associated with PPSA ($55.11), licensing, registration and applicable taxes are extra and due on signing. Total obligation is $17,418.17 plus tax. The residual value of the vehicle at end of term is $11,463.30. Annual kilometers limited to 16,000. $0.15 per excess kilometer. Excess wear-and-tear charges may apply. 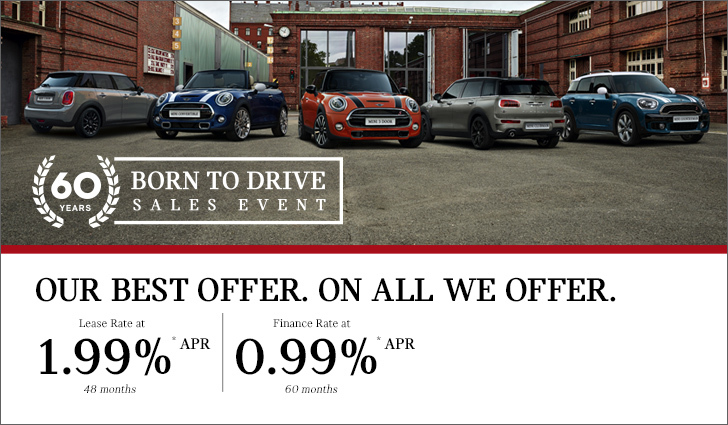 ***Finance example: Selling price of a 2019 MINI Cooper 5 door is $26,465.00, which includes MSRP ($24,390.00) and Freight/PDI ($2,475.00), less credit ($400.00), at 0.99 % APR for 60 months requires 120 bi-weekly payments of $208.74 with $0.00 down payment. Cost of borrowing is $2,746.33. Total obligation is $27,136.33. License, registration and taxes are extra and due on signing. ****MSRP starting price for a base model 2019 MINI Cooper 5 door is $24,390.00. Freight/PDI ($2,475.00), retailer administration fee (up to $395.00), tire stewardship fee ($20.00), and A/C levy ($100.00) are extra. All-inclusive starting price for a base model 2019 MINI Cooper S 5 door is $31,680.00, which includes MSRP ($28,690.00), Freight/PDI ($2,475.00), retailer administration fee (up to $395.00), tire stewardship fee ($20.00), and A/C levy ($100.00). **Lease example: Selling price of a 2019 MINI Cooper S 5 door is $30,665.00, which includes MSRP ($28,690.00) and Freight/PDI ($2,475.00), less credit ($500.00), at 1.99 % APR for 48 months. Monthly lease payment is $374.12 with $1,200.00 down payment. First month’s lease payment, security deposit of approximately one month’s payment, retailer administration fee (up to $395.00), A/C levy ($100.00), tire stewardship fee ($20.00), fees associated with PPSA ($55.11), licensing, registration and applicable taxes are extra and due on signing. Total obligation is $20,102.08 plus tax. The residual value of the vehicle at end of term is $13,197.40. Annual kilometers limited to 16,000. $0.15 per excess kilometer. Excess wear-and-tear charges may apply. ***Finance example: Selling price of a 2019 MINI Cooper S 5 door is $30,665.00, which includes MSRP ($28,690.00) and Freight/PDI ($2,475.00), less credit ($500.00), at 0.99 % APR for 60 months requires 120 bi-weekly payments of $230.04 with $1,500.00 down payment. Cost of borrowing is $2,714.82. Total obligation is $31,404.82. License, registration and taxes are extra and due on signing. ****MSRP starting price for a base model 2019 MINI Cooper S 5 door is $28,690.00. Freight/PDI ($2,475.00), retailer administration fee (up to $395.00), tire stewardship fee ($20.00), and A/C levy ($100.00) are extra. All-inclusive starting price for a base model 2019 MINI Cooper Convertible is $32,680.00, which includes MSRP ($29,690.00), Freight/PDI ($2,475.00), retailer administration fee (up to $395.00), tire stewardship fee ($20.00), and A/C levy ($100.00). **Lease example: Selling price of a 2019 MINI Cooper Convertible is $32,165.00, which includes MSRP ($29,690.00) and Freight/PDI ($2,475.00), at 1.99 % APR for 48 months. Monthly lease payment is $364.47 with $1,350.00 down payment. First month’s lease payment, security deposit of approximately one month’s payment, retailer administration fee (up to $395.00), A/C levy ($100.00), tire stewardship fee ($20.00), fees associated with PPSA ($55.11), licensing, registration and applicable taxes are extra and due on signing. Total obligation is $19,779.01 plus tax. The residual value of the vehicle at end of term is $15,141.90. Annual kilometers limited to 16,000. $0.15 per excess kilometer. Excess wear-and-tear charges may apply. ***Finance example: Selling price of a 2019 MINI Cooper Convertible is $32,165.00, which includes MSRP ($29,690.00) and Freight/PDI ($2,475.00), at 0.99 % APR for 60 months requires 120 bi-weekly payments of $233.98 with $2,500.00 down payment. Cost of borrowing is $3,227.50. Total obligation is $32,917.50. License, registration and taxes are extra and due on signing. ****MSRP starting price for a base model 2019 MINI Cooper Convertible is $29,690.00. Freight/PDI ($2,475.00), retailer administration fee (up to $395.00), tire stewardship fee ($20.00), and A/C levy ($100.00) are extra. All-inclusive starting price for a base model 2019 MINI Cooper S Convertible is $36,980.00, which includes MSRP ($33,990.00), Freight/PDI ($2,475.00), retailer administration fee (up to $395.00), tire stewardship fee ($20.00), and A/C levy ($100.00). **Lease example: Selling price of a 2019 MINI Cooper S Convertible is $36,465.00, which includes MSRP ($33,990.00) and Freight/PDI ($2,475.00), at 1.99 % APR for 48 months. Monthly lease payment is $416.19 with $1,550.00 down payment. First month’s lease payment, security deposit of approximately one month’s payment, retailer administration fee (up to $395.00), A/C levy ($100.00), tire stewardship fee ($20.00), fees associated with PPSA ($55.11), licensing, registration and applicable taxes are extra and due on signing. Total obligation is $22,513.50 plus tax. The residual value of the vehicle at end of term is $16,995.00. Annual kilometers limited to 16,000. $0.15 per excess kilometer. Excess wear-and-tear charges may apply. ***Finance example: Selling price of a 2019 MINI Cooper S Convertible is $36,465.00, which includes MSRP ($33,990.00) and Freight/PDI ($2,475.00), at 0.99 % APR for 60 months requires 120 bi-weekly payments of $273.02 with $1,850.00 down payment. Cost of borrowing is $3,353.06. Total obligation is $37,343.06. License, registration and taxes are extra and due on signing. ****MSRP starting price for a base model 2019 MINI Cooper S Convertible is $33,990.00. Freight/PDI ($2,475.00), retailer administration fee (up to $395.00), tire stewardship fee ($20.00), and A/C levy ($100.00) are extra. All-inclusive starting price for a base model 2019 MINI John Cooper Works Convertible is $44,480.00, which includes MSRP ($41,490.00), Freight/PDI ($2,475.00), retailer administration fee (up to $395.00), tire stewardship fee ($20.00), and A/C levy ($100.00). **Lease example: Selling price of a 2019 MINI John Cooper Works Convertible is $43,965.00, which includes MSRP ($41,490.00) and Freight/PDI ($2,475.00), at 1.99 % APR for 48 months. Monthly lease payment is $507.57 with $1,750.00 down payment. First month’s lease payment, security deposit of approximately one month’s payment, retailer administration fee (up to $395.00), A/C levy ($100.00), tire stewardship fee ($20.00), fees associated with PPSA ($55.11), licensing, registration and applicable taxes are extra and due on signing. Total obligation is $27,191.16 plus tax. The residual value of the vehicle at end of term is $20,330.10. Annual kilometers limited to 16,000. $0.15 per excess kilometer. Excess wear-and-tear charges may apply. ***Finance example: Selling price of a 2019 MINI John Cooper Works Convertible is $43,965.00, which includes MSRP ($41,490.00) and Freight/PDI ($2,475.00), at 0.99 % APR for 60 months requires 120 bi-weekly payments of $331.78 with $1,900.00 down payment. Cost of borrowing is $3,542.04. Total obligation is $45,032.04. License, registration and taxes are extra and due on signing. ****MSRP starting price for a base model 2019 MINI John Cooper Works Convertible is $41,490.00. Freight/PDI ($2,475.00), retailer administration fee (up to $395.00), tire stewardship fee ($20.00), and A/C levy ($100.00) are extra. All-inclusive starting price for a base model 2019 MINI Cooper Clubman ALL4 is $31,680.00, which includes MSRP ($28,690.00), Freight/PDI ($2,475.00), retailer administration fee (up to $395.00), tire stewardship fee ($20.00), and A/C levy ($100.00). **Lease example: Selling price of a 2019 MINI Cooper Clubman ALL4 is $30,665.00, which includes MSRP ($28,690.00) and Freight/PDI ($2,475.00), less credit ($500.00), at 1.99 % APR for 48 months. Monthly lease payment is $388.63 with $0.00 down payment. First month’s lease payment, security deposit of approximately one month’s payment, retailer administration fee (up to $395.00), A/C levy ($100.00), tire stewardship fee ($20.00), fees associated with PPSA ($55.11), licensing, registration and applicable taxes are extra and due on signing. Total obligation is $19,613.08 plus tax. The residual value of the vehicle at end of term is $13,771.20. Annual kilometers limited to 16,000. $0.15 per excess kilometer. Excess wear-and-tear charges may apply. ***Finance example: Selling price of a 2019 MINI Cooper Clubman ALL4 is $30,665.00, which includes MSRP ($28,690.00) and Freight/PDI ($2,475.00), less credit ($500.00), at 0.99 % APR for 60 months requires 120 bi-weekly payments of $241.87 with $0.00 down payment. Cost of borrowing is $2,752.86. Total obligation is $31,442.86. License, registration and taxes are extra and due on signing. ****MSRP starting price for a base model 2019 MINI Cooper Clubman ALL4 is $28,690.00. Freight/PDI ($2,475.00), retailer administration fee (up to $395.00), tire stewardship fee ($20.00), and A/C levy ($100.00) are extra. All-inclusive starting price for a base model 2019 MINI Cooper S Clubman ALL4 is $34,680.00, which includes MSRP ($31,690.00), Freight/PDI ($2,475.00), retailer administration fee (up to $395.00), tire stewardship fee ($20.00), and A/C levy ($100.00). **Lease example: Selling price of a 2019 MINI Cooper S Clubman ALL4 is $33,565.00, which includes MSRP ($31,690.00) and Freight/PDI ($2,475.00), less credit ($600.00), at 1.99 % APR for 48 months. Monthly lease payment is $401.00 with $999.00 down payment. First month’s lease payment, security deposit of approximately one month’s payment, retailer administration fee (up to $395.00), A/C levy ($100.00), tire stewardship fee ($20.00), fees associated with PPSA ($55.11), licensing, registration and applicable taxes are extra and due on signing. Total obligation is $21,218.06 plus tax. The residual value of the vehicle at end of term is $15,211.20. Annual kilometers limited to 16,000. $0.15 per excess kilometer. Excess wear-and-tear charges may apply. ***Finance example: Selling price of a 2019 MINI Cooper S Clubman ALL4 is $33,565.00, which includes MSRP ($31,690.00) and Freight/PDI ($2,475.00), less credit ($600.00), at 0.99 % APR for 60 months requires 120 bi-weekly payments of $248.57 with $2,050.00 down payment. Cost of borrowing is $2,674.43. Total obligation is $34,364.43. License, registration and taxes are extra and due on signing. ****MSRP starting price for a base model 2019 MINI Cooper S Clubman ALL4 is $31,690.00. Freight/PDI ($2,475.00), retailer administration fee (up to $395.00), tire stewardship fee ($20.00), and A/C levy ($100.00) are extra. All-inclusive starting price for a base model 2019 MINI John Cooper Works Clubman ALL4 is $41,180.00, which includes MSRP ($38,190.00), Freight/PDI ($2,475.00), retailer administration fee (up to $395.00), tire stewardship fee ($20.00), and A/C levy ($100.00). **Lease example: Selling price of a 2019 MINI John Cooper Works Clubman ALL4 is $39,165.00, which includes MSRP ($38,190.00) and Freight/PDI ($2,475.00), less credit ($1,500.00), at 1.99 % APR for 48 months. Monthly lease payment is $489.14 with $0.00 down payment. First month’s lease payment, security deposit of approximately one month’s payment, retailer administration fee (up to $395.00), A/C levy ($100.00), tire stewardship fee ($20.00), fees associated with PPSA ($55.11), licensing, registration and applicable taxes are extra and due on signing. Total obligation is $24,537.94 plus tax. The residual value of the vehicle at end of term is $17,949.30. Annual kilometers limited to 16,000. $0.15 per excess kilometer. Excess wear-and-tear charges may apply. ***Finance example: Selling price of a 2019 MINI John Cooper Works Clubman ALL4 is $39,165.00, which includes MSRP ($38,190.00) and Freight/PDI ($2,475.00), less credit ($1,500.00), at 0.99 % APR for 60 months requires 120 bi-weekly payments of $308.91 with $0.00 down payment. Cost of borrowing is $1,968.48. Total obligation is $40,158.48. License, registration and taxes are extra and due on signing. ****MSRP starting price for a base model 2019 MINI John Cooper Works Clubman ALL4 is $38,190.00. Freight/PDI ($2,475.00), retailer administration fee (up to $395.00), tire stewardship fee ($20.00), and A/C levy ($100.00) are extra. All-inclusive starting price for a base model 2019 MINI Cooper 3 door is $26,080.00, which includes MSRP ($23,090.00), Freight/PDI ($2,475.00), retailer administration fee (up to $395.00), tire stewardship fee ($20.00), and A/C levy ($100.00). **Lease example: Selling price of a 2019 MINI Cooper 3 door is $25,165.00, which includes MSRP ($23,090.00) and Freight/PDI ($2,475.00), less credit ($400.00), at 1.99 % APR for 48 months. Monthly lease payment is $327.91 with $0.00 down payment. First month’s lease payment, security deposit of approximately one month’s payment, retailer administration fee (up to $395.00), A/C levy ($100.00), tire stewardship fee ($20.00), fees associated with PPSA ($55.11), licensing, registration and applicable taxes are extra and due on signing. Total obligation is $16,637.52 plus tax. The residual value of the vehicle at end of term is $10,852.30. Annual kilometers limited to 16,000. $0.15 per excess kilometer. Excess wear-and-tear charges may apply. ***Finance example: Selling price of a 2019 MINI Cooper 3 door is $25,165.00, which includes MSRP ($23,090.00) and Freight/PDI ($2,475.00), less credit ($400.00), at 0.99 % APR for 60 months requires 120 bi-weekly payments of $198.49 with $0.00 down payment. Cost of borrowing is $2,713.35. Total obligation is $25,803.35. License, registration and taxes are extra and due on signing. ****MSRP starting price for a base model 2019 MINI Cooper 3 door is $23,090.00. Freight/PDI ($2,475.00), retailer administration fee (up to $395.00), tire stewardship fee ($20.00), and A/C levy ($100.00) are extra. All-inclusive starting price for a base model 2019 MINI Cooper S 3 door is $30,380.00, which includes MSRP ($27,390.00), Freight/PDI ($2,475.00), retailer administration fee (up to $395.00), tire stewardship fee ($20.00), and A/C levy ($100.00). **Lease example: Selling price of a 2019 MINI Cooper S 3 door is $29,365.00, which includes MSRP ($27,390.00) and Freight/PDI ($2,475.00), less credit ($500.00), at 1.99 % APR for 48 months. Monthly lease payment is $362.28 with $999.00 down payment. First month’s lease payment, security deposit of approximately one month’s payment, retailer administration fee (up to $395.00), A/C levy ($100.00), tire stewardship fee ($20.00), fees associated with PPSA ($55.11), licensing, registration and applicable taxes are extra and due on signing. Total obligation is $19,320.96 plus tax. The residual value of the vehicle at end of term is $12,599.40. Annual kilometers limited to 16,000. $0.15 per excess kilometer. Excess wear-and-tear charges may apply. ***Finance example: Selling price of a 2019 MINI Cooper S 3 door is $29,365.00, which includes MSRP ($27,390.00) and Freight/PDI ($2,475.00), less credit ($500.00), at 0.99 % APR for 60 months requires 120 bi-weekly payments of $219.78 with $1,500.00 down payment. Cost of borrowing is $2,681.84. Total obligation is $30,071.84. License, registration and taxes are extra and due on signing. ****MSRP starting price for a base model 2019 MINI Cooper S 3 door is $27,390.00. Freight/PDI ($2,475.00), retailer administration fee (up to $395.00), tire stewardship fee ($20.00), and A/C levy ($100.00) are extra. All-inclusive starting price for a base model 2019 MINI John Cooper Works 3 door is $37,880.00, which includes MSRP ($34,890.00), Freight/PDI ($2,475.00), retailer administration fee (up to $395.00), tire stewardship fee ($20.00), and A/C levy ($100.00). **Lease example: Selling price of a 2019 MINI John Cooper Works 3 door is $36,615.00, which includes MSRP ($34,890.00) and Freight/PDI ($2,475.00), less credit ($750.00), at 1.99 % APR for 48 months. Monthly lease payment is $457.26 with $999.00 down payment. First month’s lease payment, security deposit of approximately one month’s payment, retailer administration fee (up to $395.00), A/C levy ($100.00), tire stewardship fee ($20.00), fees associated with PPSA ($55.11), licensing, registration and applicable taxes are extra and due on signing. Total obligation is $23,974.88 plus tax. The residual value of the vehicle at end of term is $15,700.50. Annual kilometers limited to 16,000. $0.15 per excess kilometer. Excess wear-and-tear charges may apply. ***Finance example: Selling price of a 2019 MINI John Cooper Works 3 door is $36,615.00, which includes MSRP ($34,890.00) and Freight/PDI ($2,475.00), less credit ($750.00), at 0.99 % APR for 60 months requires 120 bi-weekly payments of $276.97 with $1,500.00 down payment. Cost of borrowing is $2,615.75. Total obligation is $37,505.75. License, registration and taxes are extra and due on signing. ****MSRP starting price for a base model 2019 MINI John Cooper Works 3 door is $34,890.00. Freight/PDI ($2,475.00), retailer administration fee (up to $395.00), tire stewardship fee ($20.00), and A/C levy ($100.00) are extra. **Lease example: Selling price of a 2019 MINI Cooper Countryman ALL4 is $33,065.00, which includes MSRP ($31,090.00) and Freight/PDI ($2,475.00), less credit ($500.00), at 1.99 % APR for 48 months. Monthly lease payment is $417.56 with $0.00 down payment. First month’s lease payment, security deposit of approximately one month’s payment, retailer administration fee (up to $395.00), A/C levy ($100.00), tire stewardship fee ($20.00), fees associated with PPSA ($55.11), licensing, registration and applicable taxes are extra and due on signing. Total obligation is $21,030.78 plus tax. The residual value of the vehicle at end of term is $14,923.20. Annual kilometers limited to 16,000. $0.15 per excess kilometer. Excess wear-and-tear charges may apply. ****MSRP starting price for a base model 2019 MINI Cooper Countryman ALL4 is $31,090.00. Freight/PDI ($2,475.00), retailer administration fee (up to $395.00), tire stewardship fee ($20.00), and A/C levy ($100.00) are extra. All-inclusive starting price for a base model 2019 MINI Cooper S Countryman ALL4 is $37,080.00, which includes MSRP ($34,090.00), Freight/PDI ($2,475.00), retailer administration fee (up to $395.00), tire stewardship fee ($20.00), and A/C levy ($100.00). **Lease example: Selling price of a 2019 MINI Cooper S Countryman ALL4 is $35,965.00, which includes MSRP ($34,090.00) and Freight/PDI ($2,475.00), less credit ($600.00), at 1.99 % APR for 48 months. Monthly lease payment is $429.93 with $999.00 down payment. First month’s lease payment, security deposit of approximately one month’s payment, retailer administration fee (up to $395.00), A/C levy ($100.00), tire stewardship fee ($20.00), fees associated with PPSA ($55.11), licensing, registration and applicable taxes are extra and due on signing. Total obligation is $22,635.76 plus tax. The residual value of the vehicle at end of term is $16,363.20. Annual kilometers limited to 16,000. $0.15 per excess kilometer. Excess wear-and-tear charges may apply. ***Finance example: Selling price of a 2019 MINI Cooper S Countryman ALL4 is $35,965.00, which includes MSRP ($34,090.00) and Freight/PDI ($2,475.00), less credit ($600.00), at 0.99 % APR for 60 months requires 120 bi-weekly payments of $271.05 with $1,600.00 down payment. Cost of borrowing is $2,746.72. Total obligation is $36,836.72. License, registration and taxes are extra and due on signing. ****MSRP starting price for a base model 2019 MINI Cooper S Countryman ALL4 is $34,090.00. Freight/PDI ($2,475.00), retailer administration fee (up to $395.00), tire stewardship fee ($20.00), and A/C levy ($100.00) are extra. All-inclusive starting price for a base model 2019 MINI John Cooper Works Countryman ALL4 is $42,780.00, which includes MSRP ($39,790.00), Freight/PDI ($2,475.00), retailer administration fee (up to $395.00), tire stewardship fee ($20.00), and A/C levy ($100.00). **Lease example: Selling price of a 2019 MINI John Cooper Works Countryman ALL4 is $40,765.00, which includes MSRP ($39,790.00) and Freight/PDI ($2,475.00), less credit ($1,500.00), at 1.99 % APR for 48 months. Monthly lease payment is $479.16 with $999.00 down payment. First month’s lease payment, security deposit of approximately one month’s payment, retailer administration fee (up to $395.00), A/C levy ($100.00), tire stewardship fee ($20.00), fees associated with PPSA ($55.11), licensing, registration and applicable taxes are extra and due on signing. Total obligation is $25,047.79 plus tax. The residual value of the vehicle at end of term is $19,099.20. Annual kilometers limited to 16,000. $0.15 per excess kilometer. Excess wear-and-tear charges may apply. ***Finance example: Selling price of a 2019 MINI John Cooper Works Countryman ALL4 is $40,765.00, which includes MSRP ($39,790.00) and Freight/PDI ($2,475.00), less credit ($1,500.00), at 0.99 % APR for 60 months requires 120 bi-weekly payments of $305.76 with $2,000.00 down payment. Cost of borrowing is $1,958.33. Total obligation is $41,748.33. License, registration and taxes are extra and due on signing. ****MSRP starting price for a base model 2019 MINI John Cooper Works Countryman ALL4 is $39,790.00. Freight/PDI ($2,475.00), retailer administration fee (up to $395.00), tire stewardship fee ($20.00), and A/C levy ($100.00) are extra.